If your Maytag washer isn’t agitating or draining, the motor that powers these steps may be broken. This is the drive motor, which powers the transmission and the drain pump. 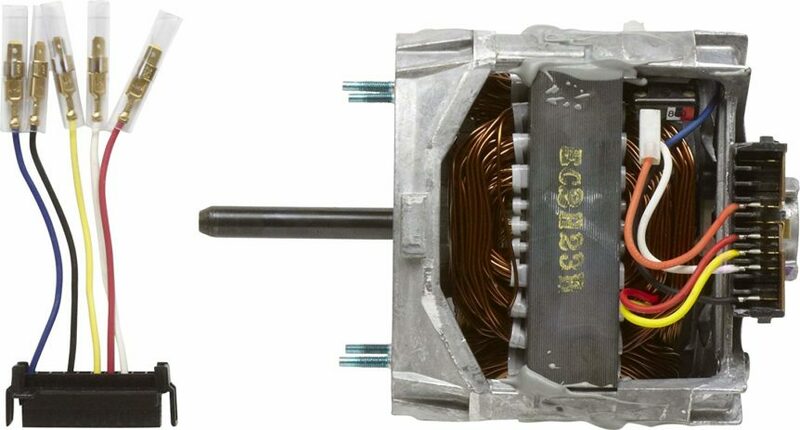 To replace the part, order a replacement drive motor (part #12002351 for most Maytag models) and follow these steps. While you remove the old drive motor and install the new one, you’re going to be disconnecting wires. Unplug the washer before you even get started to separate the washer from its power source and keep yourself safe from electrical shocks. 2. Disassemble the front and bottom of the washer. First, remove the front access panel. To do this, remove the two screws holding it in place against the body. Swing the bottom of the panel out so you can unhook the top of the panel from the groove. Set the panel aside. Next, tilt the machine back at an angle so you can access the parts at the bottom. Make sure you have a stable block to hold it up at an angle as you work. Then remove the two belts you find at the bottom of the machine. Start by removing the straight pump pulley belt and then the diagonal transmission pulley belt. Remove them by hand by rolling the pulleys as you pry them over the groove edges. After that, remove the motor pulley. This is the smaller pulley in the left corner. To start, push an Allen wrench into the set screw opening in the side. Hold the motor pulley in place and you turn the screw to loosen it. Don’t remove it entirely; just unscrew so it’s out of the way. Then pull the pulley off the shaft. This may be difficult because of years of buildup, but nothing else is securing the part. Set the washer back down. 3. Remove and isolate the motor. Locate the motor in the front left corner of the washer’s body cavity. Start removing the layers of parts. First, remove the ground screw wire in the front. Next, remove the motor cover. Unscrew the cover from the side panel and pry it off of the motor. Set the cover aside. After that, disconnect the wires attached to the motor. Pry them free from the terminals with a flathead screwdriver. Push the wires back into the cavity out of the way. Then unscrew the motor’s bracket at the bottom of the washer. There are three screws in total. Remove the assembly by tilting it up and sliding it forward to release it from mounting tabs at the back. Then pull out the whole assembly. Flip it upside down and start to remove the base. Reach down through the cutouts to remove the four nuts holding the motor to the bottom (now top) bracket. Set all of the nuts aside and then lift the bracket up off the shaft and away. Lastly, remove the ground wire. The new part doesn’t come with one of its own, so you’ll need to switch this one over to the new motor. 4. Install the new motor. Before you install the motor into the washer, you need to reassemble the surrounding parts. First, flip the motor over so the shaft is extending upwards, and locate the short pin on one of the corners. Slide the ground wire over the pin. Next, reattach the base. Push the two halves of the spring-loaded base together and then press it down over the shaft and the four studs on the top of the motor. Secure it by tightening the four bolts. Flip the motor over and orient it so the side of the bottom bracket with the two cutouts faces the rear of the machine. Slide the bracket over the two mounting tabs in the bottom panel and set the whole assembly down. Secure it by tightening the one screw at the front and the two screws in the back. The motor assembly might be in the way when you try to tighten the front screw, so just push it back. After that, start reattaching the wiring. The new motor will come with new wiring transitions, and you’ll need this if you have an older machine. To add the new wiring, pull the washer wires forward from the body cavity and match them up color by color. Use needlenose pliers to firmly press each wire over the matching terminal. Once all five wires are connected to their identical colors, push the black plug into the socket at the back of the motor. Make sure you hear both locking tabs engage. Push the excess lengths of wiring back into the rear of the body cavity out of the way. Top off the assembly with the motor cover. Orient it so the tab lines up with the front of the side panel. Then lower the cover so it sits on top of the motor assembly. The two holes in the tab should line up with the holes in the edge of the side panel. Tighten the screw through both holes to secure the cover. Then resecure the grounding wire. To do this, line up the free end with the hole in the edge of the bottom panel, slide the screw through both holes, and tighten the screw. First, tilt the machine back again at a forty-five-degree angle so you can easily access the bottom. Next, reattach the motor pulley. Push the pulley over the shaft so that the hole for the set screw is on the same side as the flat panel of the shaft. It needs to line up so the screw has a flat surface to wedge against. Make the pulley’s bottom flush with the bottom of the shaft. Once it’s in place, hold it with your hand as you use the Allen wrench to tighten the set screw. After that, reattach the two belts. Start with the larger belt that extends from the central pulley to the corner. Wrap the pulley around the corner side of the motor pulley (on the top, larger edge) and as much of the transmission pulley as you can. Turn the transmission pulley so the belt wraps itself more and more into position in the grooves. Then wrap the second belt around the pump pulley and the lower circular edge of the motor pulley. Just like before, turn the pulleys so you know the belt is fully in the groove. Then carefully lower the washer back so it’s standing straight. Reattach the front panel. Slide the top into position so it locks onto the lip, and then tilt the bottom portion of the panel down so it’s flush with the front of the machine. Secure it with the two screws at the bottom of the panel. Push your washing machine back into position and plug it in. Your next cycle should both agitate and have drainage. For more appliance repair guides, browse our resources at Dan Marc Appliance.